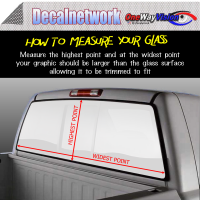 Perforrated window film by Decalnetwork. Perforated window film has been popular for vehivle window graphics, but there are more uses for this vinyl. This product material is printed to be installed on the outside of the glass. Our camo film is great for hunting blinds. Purchase in smaller sheets or purchase our larger sheets for one piece installations.